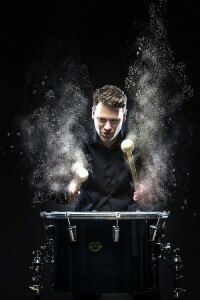 Joby Burgess is one of the most versatile and in-demand percussionists in the UK, and he has recorded and toured with the likes of Peter Gabriel, Stewart Copeland, Pete Tong, Christophe Beck, and Will Gregory, to name a few. He has also appeared on soundtracks to movies such as Black Panther, The Darkest Hour, Paddington 2, Trolls, and many more. 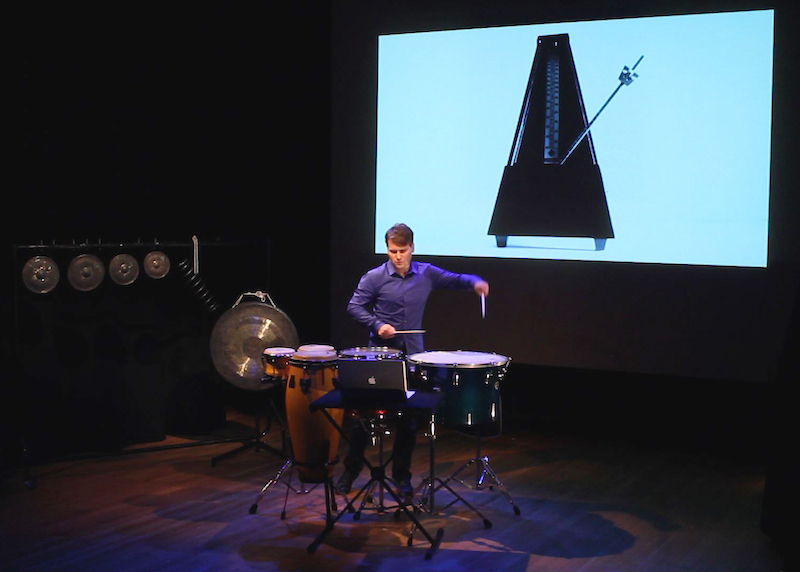 His project Powerplant – a collaboration with sound designer Matthew Fairclough and visual artist Kathy Hinde – combines a modern approach to percussion with the new age of electronics, all underpinned by engaging visuals on a full backdrop screen. It’s a unique combination, which has earned him recognition far beyond Europe’s borders. What was your way into music? I grew up in a household not of musicians, but which was always full of music. My dad had a passion for Hi-Fi, and music from all corners of the globe, everything from grand Italian opera, jazz – particularly the Modern Jazz Quartet- female vocalists from the world of rock, core classical repertoire and some wild experimental things. I grew up in that environment. There was always music playing and I soaked up a lot, by listening to that. When I was about seven I started taking piano lessons, which I was not particularly good at. And I was already into buying my own music at that young age, spending my pocket money on records on a Saturday morning. I also started playing around with writing songs, playing piano and using a four-track tape recorder – those were the beginnings I suppose. More than anything I wanted to be the singer in a pop band – I think a lot of people do at a young age! When I got to secondary school I decided that the drum kit looked and sounded like a really cool instrument. There was a good teacher who came in once a week and I wanted to get lessons, but there were no spots free so I basically just bullied my head of music into letting me do it. I took to drums quite quickly, it felt natural, and within a few months I was playing in the big band and some small jazz groups – but with the big kids. I was 12 and they were 16-18, that was brilliant grounding for me, playing with way more experienced musicians. So I really grew up as a drummer, but as I went through school there were just more opportunities for percussion. 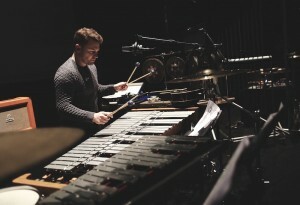 I was asked to play in the orchestra and it was a matter of: “Can you play the glockenspiel? Can you play this and that…?”. It was all about just having a go and transferring those skills from the kit to all these other sounds. I started percussion tuition aged around 16 with the brilliant Jayne Obradovic and this is when I started learning marimba. I also started getting exposed to much more modern music, and my taste in rock, jazz and classical music became more wide and adventurous. There were always those different strands in my life – even from a young age – studying music at a conservatoire was the next obvious step. You went on to study music in London? Yes, I took a place at the Guildhall School of Music & Drama, which is in the heart of the City of London. 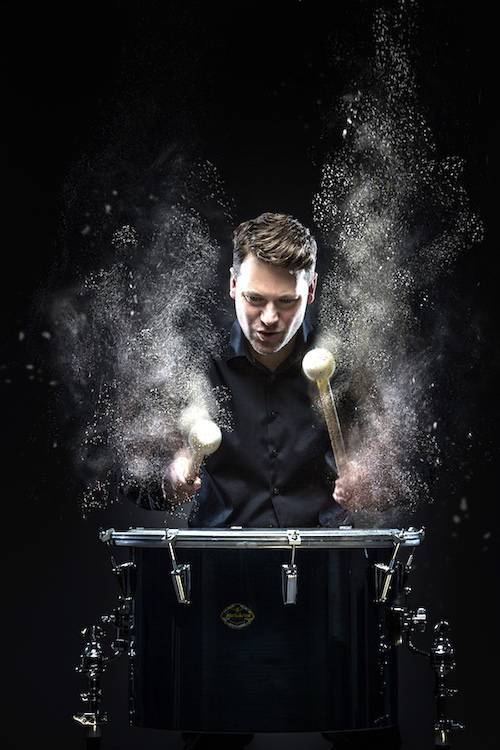 I actually studied classical percussion, which at the time was still relatively new to me. I don’t know how I scraped a place on the course, they tried out a pretty intimidating ‘public’ audition process that year and I was the first person not to break down – I guess that helped! I went to Guildhall and worked my arse off for five years, developed my listening and got more and more into playing music at the experimental end of the scale. I was still writing songs, leading my own band and recording songs in the college studio, loads of stuff was going on. I suppose I was just trying to find what it was that I really liked. That process has carried on for the next 20 years, slowly burning things away to find my place in this big musical world. A big part of your career was Ensemble Bash. How did that come about? As I left college one of my teachers and founding member Richard Benjafield decided that he had enough after nine years and I took his spot for the next 16 years. That was a great opportunity and the group was pretty much at the top of its game. We had 50 plus gigs a year, good national and a bit of an international profile as well, and we were often invited to work with guest artists. Two of the guests I worked with first were Joanna MacGregor, who is a very adventurous, classically trained pianist with a wide interest in jazz and rock. The five of us did some really exciting shows and she was and remains one of my role models. The other person was the drummer Steward Copeland. We worked together a lot for about four or five years, initially on Orchestralli – a collection of Stewart’s film and TV music. Those associations and meeting people like Joanna and Stewart, who then phoned me up and booked me for other projects they were working on, really broadened my path and helped me connect with some amazing musicians. At that time I was only in my early 20s, fresh faced, and it was brilliant to be welcomed into that world. Working with such experienced and developed musicians, meant I could magpie bits and pieces to add to my own skill base, those early experiences have been hugely valuable in making me the musician that I am today and taught me to be versatile enough to work pretty much anyone. As a result I rarely get into a situation where I feel out of my comfort zone, which means whatever is thrown at me, I can find a way to deal with it – which is very important in this business. I mean, we’re sitting in the garden at Abbey Road Studios where I often record percussion on film and TV scores or add percussion to an artist’s new record. Here time is money and things often have to happen fast, you have to be able to handle that. I retired from Bash last year because I didn’t have enough time to continue and it just wasn’t really fair on the music or everyone else. That group has changed a bit now and I hope they can find a new and exciting direction. You have commissioned a lot of new music. Does that tend to be the way in your field rather than writing material yourself? Commissioning has kind of been my life because I haven’t really written much music at all. Both Bash and New Noise (a duo with oboist, Janey Miller) commissioned hundreds of pieces of new music. My audio-visual project Powerplant is also a commissioning project as well. 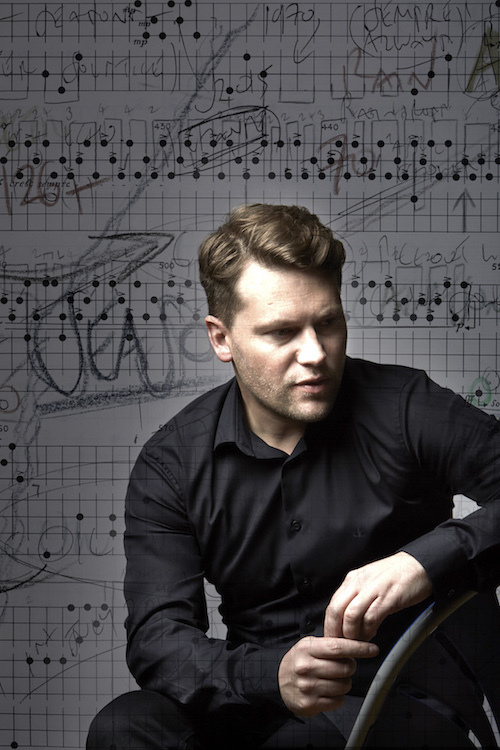 For me working with composers is something I really enjoy and something I do on a daily basis. Writing music takes a long time and I’m out there playing and recording most of the time. I’m a performer, that’s what I’m really good at and there are people who write music and they’re really good at that. They have crafted their skills as I have crafted mine. The really exciting thing for me is the dialogue we have when we’re creating something new. You must learn a lot about their music and intentions this way as well compared to the majority of people who just get the finished piece of paper with notes on. Yes, I like actually talking with and being in the same room as the composers I work with. 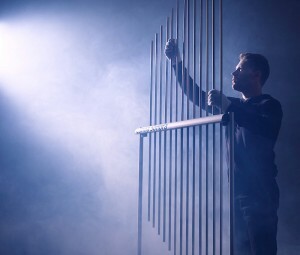 The process of commissioning for me is now quite a long thing and each new piece has a real journey – the relationship between performer and composer is very important. For example Will Gregory, the producer from Goldfrapp wrote me a tremendous piece for bass marimba and tape loops, inspired by the psychedelic sounds of late 60’s San Francisco, which was a year in the making. We first met about 10 years ago and slowly we have worked on more and more projects together. The nice thing about that is that I start to understand Will’s process in terms of writing and what he’s trying to achieve. I end up going on tour with these people who write music for me. They tend to be people that I like and develop friendships with. I know what coffee they like and which restaurant they want to go to – that is kind of really key because if you go on tour with people or hang out in the studio for a week and you don’t get on, it is unlikely you are going to make anything really good. Let’s talk about your main project ‘Powerplant’? Coming out of college I spent a long time crafting my technique and being able to play the vast range of percussion instruments. I had been doing quite a lot of work with our sound and electronics guy Matthew Fairclough, where I was playing acoustic instruments and he would process the sounds. I just really wanted to get back into sitting in the studio, twiddling knobs and playing music with an electronic sound. That was the initial thing. I had been working with a company in Leicester called Wernick Musical Instruments who make a brilliant midi controller, the Xylosynth which I added as my main electronic instrument. Played with mallets, it is like a vibraphone keyboard, with wooden keys that sends out MIDI and feels really good. 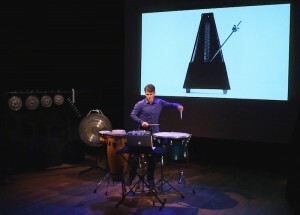 I didn’t want to simply replicate acoustic percussion, but to play synths, drum loops and all that sort of stuff. I made a simple live looping system and we did our first show reworking the music of Kraftwerk and Steve Rush in 2005. Video artist Kathy Hinde joined us and we also had the incredible Elysian String Quartet – it was a fantastic start, selling out our debut show at London’s Southbank Centre as part of the (now sadly no-longer running) RhythmSticks Festival. After that we spent three years thinking about how we could tour it. It’s such a big thing to tour, so many instruments, so much technology! In 2008 things started to really take off, we played 50 shows in the UK that year, released our first record, everything has grown from there. You’ve also done a lot of touring with Peter Gabriel and his New Blood orchestra? Yes, I worked with Peter for about three years. He had recorded an album without any drums, percussion and guitars on it. When it came to tour it, I suspect they felt that a three hour show might require some additional momentum. 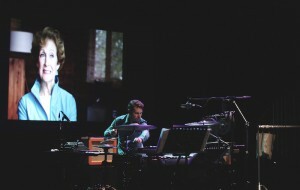 They added some material from Peter’s back catalogue which required percussion and I got the call to play percussion. I had a huge set up with marimba, vibraphone, crotales, glockenspiel, plenty of big drums and cinematic percussion effects, plus a suitcase full of toys. I think we did seven tours over three years and it was an amazing band and project to be a part of. We played some great venues, including Red Rocks in Denver and I made my first tour to South America, plus recording the ‘New Blood’ album. Peter was a great guy to work with and it was a seriously top 44 piece band, largely all colleagues that I now work with here in London’s session world. The tricky part for me was that we had overdubbed so much percussion for the album, but they just wanted me on the tour, so I had to figure out ways to replicate three or four parts by myself. I remember very early on getting a call from arranger John Metcalfe who said: “Peter wants to talk to you about triangles”. So our first ever conversation was something along the following lines “Hi Joby, its Peter. I’ve got this thing I love about triangles. Can you get two exactly the same but then take a little bit of metal off one of them so they’re just out of tune.” I was like yes, sure and went and borrowed a dozen triangles to find 2 that were just out of tune. You get this incredibly weird effect called ‘beating’ and it is the sound we used on ‘Mercy Street’. It was really interesting, a small but very specific detail coming straight from the artist and it sounds amazing! I have certainly inherited Peter’s love of triangles. You do a lot of sessions recording film music as well. Yes, I’ve done more and more over the years and now things are busier than ever for me in that world. I’ve been lucky to do some really nice films over the last few years. For me it’s as much about sound and colour and finding the instrument that sits in the right place sonically. I’m am very lucky to be here in London, because I get to work with a tremendous group of seasoned percussionists and drummers who I have learnt so much from – Frank Ricotti, Gary Kettel, Paul Clarvis, Ralph Salmins, Ian Thomas to name a few. When I first got called I just soaked up the sounds and dynamics that the guys played with. Everyday was, and still is, a learning day. Many of the sessions I do, are on my own. A lot of percussion, even if it’s an orchestral thing, we come in separately and do our thing because we can use the space in a different way. More recently I have had the opportunity to lead the percussion section, which has a whole different set of challenges. It’s a really enjoyable working environment to be in, with the simple goal of recording the best performance for the composer on whatever film, record or artist we are working with that day. How do you approach sessions like this? As a percussionist you play hundreds of different instruments. Do you just bring a truckload of stuff? Normally for a big film session everything will be scored and the orchestrator or music administrator will send through a list of instruments in the part. You then have to look through the list, acknowledge it and then make sure you have all the appropriate sounds and options ready to go. Having the options and the experience to be able to improvise an instrument or sound immediately, even though it’s not been asked for, is very important. Whilst something might be scored for 15 tom toms, you possibly don’t want that, you need a range of lows, mids and highs with different colours, so you can blend that drum sound. You have to allow for all this so you can then have a conversation with the composer or producer. Quite often we would go in and listen to the track and you can hear what is already there or what’s missing. You really develop your ears, to find your space in the track. 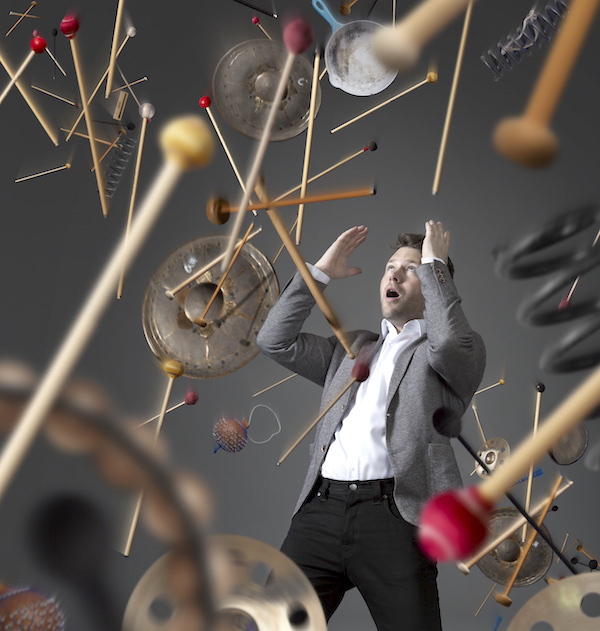 But yes, the faff of organising percussion can be a real minefield. 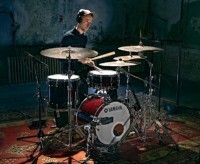 Compared to drums … I mean drums is easy … a bunch of nice drums and a bag of cymbals. It must be lovely to be a drummer, you could even get them in a sports car! Talking about sounds, you recorded the Spitfire percussion sample library? Sampling that has really taken off in recent years and Spitfire Audio is an amazing British company who has been in the game for about 10 years now. They invited me quite early on to do a percussion library. I think we did nine 9-hour days at Air studios, which was a really tough and tiring job. However, the result is awesome and I often receive messages from composers and producers who love using the library. We recorded the instruments I played at that time, which was about eight or nine years ago now, so it might possibly be time for an update. If a composer wants to convince a production company to spend a lot of money hiring and recording a big group of musicians for a couple of days, then sending them a demo with cheap sounds is not gonna do the trick. The idea is to use the samples to make the demo sound great and convince them to hire the musicians. Now occasionally ‘they’ prefer the samples to the real players, which is a little bit of a problem. However buying a sample pack doesn’t make you a percussionist … there is a huge amount the musician can add. You became a professor of percussion at Junior Trinity in 2004. Has teaching always been a passion? Until the last few years I always had a teaching gig – maybe one day a week was committed to teaching. It’s great and it can teach you an awful lot about your own playing. I was at Junior Trinity for eight years and I was really lucky to have a fantastic group of young people between 16 and 19 years old and help them with the foundations of their technique and open their eyes and ears to the big wide world of percussion. Many of them have gone on through conservatoires and many are now working in the industry as well. It is something I miss, but at the moment I just don’t have time to do anything regular. I often give master classes or see students for one off lessons. It is very inspiring working with younger musicians and a great way to keep touch with the next generation of drummers and percussionists. On the topic of learning: With all these instruments you have to be a master of, it must be quite overwhelming what to work on or practise? You kind of just have to work on the thing that you’re engaging in at that moment. People often ask me “what’s your favourite piece of music?” for me that has to be the piece of music I’m working on playing that day. That also tends to be the thing that requires my focus in terms of the techniques and sounds I’m combining to make an instrument. I sort of see percussion like that. I think for most drummers the drum kit is not a kick drum, snare drum, hi hat and cymbals – it’s a drum set. When I play percussion I sort of build my own set up out of all the instruments I need for a piece. Once I get this set together I start improvising trying to find ways to play it, the best mallets and the most ergonomic way to play it. 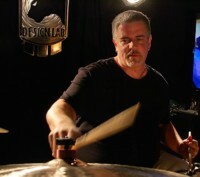 I still stick to the idea of playing shapes – most often triangles – it is really just pushing the idea of having a snare, two rack toms and a floor tom a little further. When I get a new instrument, I will spend a lot of time improvising on it just to experience it and enjoy playing it. The Canna Sonora a new version of the 1920’s Aluminium Harp has been a focus for a while. I try to be fairly organised with my studio so I have all the instruments up and probably ready to record for anything I am working on at that time. If you’re working doing commercial sessions you have to be able to pick up an instrument and just play it … there are hundreds. Lots of them have techniques and ideas that cross over, however some of them don’t. I am finishing my next album ‘Pioneers of Percussion’, which is a totally solo thing. It has a little bit of electronics and a tiny bit of video but it’s basically just me. I’ve been recording it in my home studio between other projects, but as sometimes happens other things get in the way, hopefully a release late this year. In the studio I have just been finishing up recording percussion on the latest Marvel film, on the road I’ll be joining Martyn Ware (Human League and Heaven 17) in a couple of weeks alongside Will Gregory and his Moog Ensemble at the Elbe Philharmonic Hall in Hamburg. Later in the year – and probably over summer a little as well – I’ll be back on two tours I’ve been doing recently Pete Tong and the Heritage Orchestra’s ‘Ibiza Classics’ a seriously fun gig and a fun night out for 20,000 people and Sasha’s ‘Refracted’ – another big 90’s DJ. Sasha’s show is a darker, more clubby affair, with 20 minute tracks as opposed to 5 minute mixes. Thanks a lot for your time Joby!